3abr4:30 pm- 6:30 pmMEP Public session on UN World Water Development Report: "Leaving no one behind"
The MEP Water Group and the World Water Assessment Programme of UNESCO are co-organising a public session on the new UN World Water Development Report: “Leaving no one behind: sustainable water management and governance from a European perspective”. The event will take place on the 3rd of April from 16h30 to 18h30 at the European Parliament in Brussels (room JAN 6 Q 2). 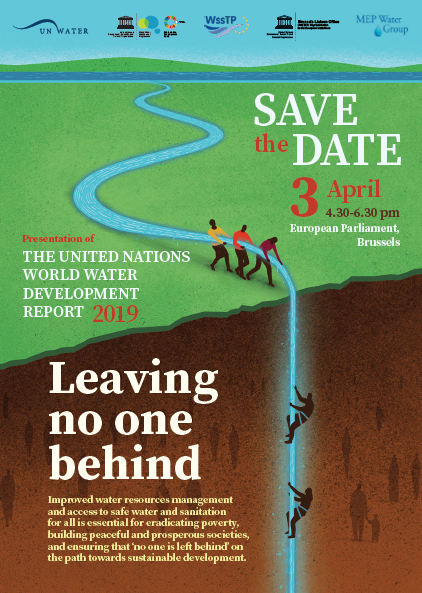 The 2019 edition of the UN World Water Development Report seeks to inform policy and decision-makers, inside and outside the water community, how improved water resources management and access to safe water and sanitation for all is essential for eradicating poverty, building peaceful and prosperous societies, and ensuring that ‘no one is left behind’ on the path towards sustainable development. Access to safe, affordable and reliable drinking water and sanitation services are basic human rights, as they are indispensable to sustaining healthy livelihoods and maintaining people’s dignity. Sustainable Development Goal 6 is crystal clear: water for all by 2030. By definition, this means leaving no one behind. Exclusion, discrimination, entrenched power asymmetries, poverty and material inequalities are among the main obstacles to fulfilling the human rights to water and sanitation and achieving the water-related goals of the 2030 Agenda for Sustainable Development. The main policy messages and findings from the report will be presented during the public session, followed by a high-level panel discussion. A detailed programme will become available soon. En esta jornada se tratarán todos los aspectos relativos al uso de la herramienta INGURUNET, nuevo sistema de información y tramitación ambiental del Departamento de Medio Ambiente, Planificación Territorial y Vivienda diseñado para tramitar electrónicamente con esta administración cualquier procedimiento administrativo de carácter ambiental e intercambiar con las administraciones públicas, organizaciones y empresas toda aquella información y/o documentación necesaria para cumplir las obligaciones de información medioambiental. La grabación estará disponible en esa misma dirección. El próximo 23 de abril la Asociación Española de Normalización, UNE, en colaboración con AEAS, ASPAPEL, STANPA y ADELMA, organiza en su sede una sesión para presentar la nueva Norma UNE 149002 Criterios de aceptación de productos desechables vía inodoro. Agenda:The programme includes high level and technical meetings with public authorities and business organisations. Costs: Participation is free of charge but travel arrangements and accommodation costs are under the responsibility of each participant. Targeted sectors (non-exclusive list): Waste management (plastics, construction, e-waste, solid and domestic waste), Air pollution, Urban, Water, Chemicals. Registration: REGISTRATION IS OPEN. Deadline to register is Friday 1st March 2019. Dow webinar to discuss future trends and current thinking in low-carbon designs for the built environment and learn about a proven collaborative blueprint for industry value chains adopting low-carbon solutions. How can we turn buildings, the second largest emitter of energy-related CO2 by sector, into low carbon models? As global population grows, urban growth is inevitable. Over the next 40 years, the world is expected to build 230 billion square meters in new construction. That’s roughly equivalent to adding another Paris to the planet every single week. This rapid development directly correlates to more energy used and carbon dioxide emissions and despite recent progress, buildings and construction together account for nearly 40% of energy-related carbon dioxide emissions when upstream power generation is included. The energy intensity per square meter of the global building sector needs to decrease on average by 30% by 2030 (compared to 2015) to be on track to meet global climate ambitions set forth in the Paris Agreement. Solutions to mitigate the issue exist. Architectural, engineering and technology evolution over the years have enabled many advancements in the built environment. The innovations needed are in how we change business-as-usual and make decisions throughout the value chain that help to create lower carbon cities. The webinar panel will discuss challenges and promising solutions that can help drive change. Jing Wang, North Asia Director, U.S. Green Building Council & Green Business Certification Inc.
1. Learn about the industry value chain collaborations Dow has with the American Institute of Architects (International Region) and the U.S. Green Building Council as part of Dow’s Carbon Partnership with the International Olympic Committee. 2. Get insights from industry experts about the role of design in implementing sustainable solutions to address embedded and operational carbon emissions and energy use. 3. Join the discussion on why the green building movement should take a top-down approach, how investors play a key role in the process and what the available tools to add transparency to green buildings. 4. Learn about Dow’s solutions that enable higher performance of glass façade on buildings. ICEX España Exportación e Inversiones organiza, a través de la Oficina Económica y Comercial de la Embajada de España en Cantón, un Foro de Inversiones y Cooperación Empresarial España-China, que tendrá lugar los días 28-30 de abril de 2019 en Shenzhen, con el objetivo de facilitar a las empresas españolas la identificación de oportunidades de inversión y cooperación empresarial, así como de potenciales socios en China ayudando a promover, consolidar y reforzar la presencia de las empresas españolas en este mercado. Componentes de Automoción; Diseño Industrial y Robótica; Economía Digital; Educación; Logística y Transporte; Medio Ambiente; Sanidad; Smart Cities. (Consultar el ANEXO II – “Análisis de los sectores de interés”). – Igualmente, cuenta con excelentes infraestructuras y una localización estratégica privilegiada. Además, es una de las zonas más abiertas del mundo para el establecimiento de negocios con una legislación muy avanzada en materia de creación de empresas y seguridad jurídica. No en vano, en 2018 fue elegida como la mejor ciudad para hacer negocios en China, de acuerdo al ranking anual publicado por la institución china Academy of Greater Bay Area Studies. (Consultar el ANEXO I – ¿Por qué China? ¿Por qué Shenzhen). Esperando contar con su asistencia, quedamos a su entera disposición para resolverles cualquier duda en relación a esta actividad.